The Virtual Robotics Toolkit (VRT) is an advanced simulator designed to enhance the LEGO(r) MINDSTORMS(r) experience. An excellent learning tool for classroom and competitive robotics, the VRT is surprisingly easy-to-use and is approved by teachers and students. Bring your virtual creations to life! The Virtual Robotics Toolkit can import files created using a number of free 3D modeling tools. Within minutes you can easily import your model into a physics enabled simulation. The simulator's advanced physics engine affords an unparalleled level of realism. Experiment with how various physical forces act on your robot, change the friction on the playing surface, or modify gravity to see how your robot would behave in a weightless environment! 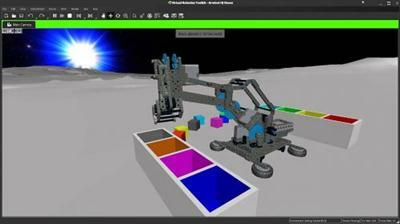 Use the official LEGO?� MINDSTORMS?� EV3 programming environment to write programs to control your virtual robot, just as you would the real thing. If you're familiar with MINDSTORMS programming, you already know how to use our simulator. See what your robot sees, visualize the sensor outputs in an easy to understand way. The Virtual Robotics Toolkit comes with support for a number of sensors including Ultrasonic, Color Touch, Infrared and more!